For Buyers: The median home size sold through the MLS this year is 1,774 square feet. Interestingly, this measure has not fluctuated more than a couple square feet up or down since 2015. Considering the increasing cost per square foot, the fact that the median sized home sold has not fluctuated much means that buyers are willing to pay more for the right sized home if they have the choice. For buyers with less flexibility on price, the cost of waiting comes in the form of sacrificing extra closet space, work space, or even a bedroom. Last year, the median home size for buyers in the $150K-$175K price range was 1,470sf. This year it’s only 1,380sf, a difference of 90 square feet. For Sellers: The first half of 2017 was more exciting than the second half is turning out to be so far for MLS sales. 1st Quarter 2017 MLS sales outperformed 2016 by 14% and 2nd Quarter sales were up 7%, so a 2% growth rate for the 3rd Quarter puts a damper on our excitement. Low supply in the lower price ranges is mostly to blame as it’s difficult to have record sales growth if there are fewer people willing to sell their home. There are more people willing to put their home on the market in the higher price ranges however. 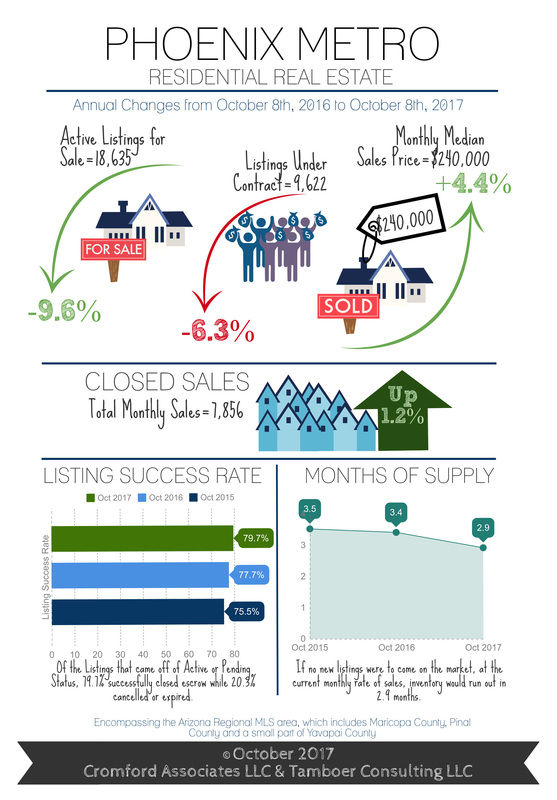 New listings over $600K were up nearly 10% in the 3rd Quarter and sales were up an impressive 27%. While there is a Christmas zone, this isn’t just about Christmas. This huge festival of lanterns and lights celebrates regions and cultures of the world in downtown Phoenix. It’s on USA Today’s list of Top 5 Over-the-Top Holiday Lights. Closed on Dec. 26. Each year the Phoenix Zoo puts up an amazing holiday display called ZooLights. This event is about holiday lights, music, and lighted animal sculptures, not live animals. 5:30 to 10:30 p.m. The Fairmont Scottsdale Princess puts on its holiday dress and transforms itself into a sparkling winter wonderland for this event. Skate on real ice on the resort’s Desert Ice Skating Rink and check out the Christmas tree light show against the resort’s facade. And who wouldn’t love to make a furry friend at Build-a-Bear Workshop? Each year during the holiday season the Desert Botanical Garden lines the paths of its extraordinary landscape with thousands of luminarias. You can get a bite to eat at the Patio Cafe and get a glass, bottle, or flight of wine. Live entertainment every night as a soundtrack for this one-of-a-kind experience. This is a ticketed event, and it is smart to book in advance. 5:30 to 9:30 p.m.
1.5 million multi-colored twinkling holiday lights throughout a 12-block area that includes the Old Towne and Catlin Court districts. Lights will shine brightly every night from 5 to 11 p.m.
Take a train ride through many festive holiday lights and displays that turn the Railroad Park in Scottsdale into a winter wonderland. On opening night, Dec. 1, 2017, you’ll also be treated to a visit from Santa, a tree-lighting ceremony, and live entertainment. Santa will hold court in a historic train car until Dec. 23. You can ride the Paradise & Pacific Railroad through this holiday spectacle from 6:30 to 9 p.m. Closed Dec. 4, 24, 25, and 31. Westgate Entertainment District is lighting its 33-foot tree on Nov. 21 followed by snowfall. Throughout the holiday season, there will be ice skating, free horse-drawn carriage rides, and a nightly snowfall, plus photos with Santa. Throughout the holiday season, you can visit downtown Mesa and take part in their holiday festivities. Four-story Christmas tree, skate around their outdoor ice rink, and take pictures at “Santa’s Selfie Village.” Downtown Mesa, Main Street between Country Club and Mesa Drive Time: 5 p.m. – 10 p.m. (ice rink hours vary)Admission: $10 for one hour of skating. The floating units enter Tempe Town Lake at the Tempe Town Lake Marina and make their way to the north shore. The U-shaped parade route travels west to the buoys east of Tempe Center for the Arts, where they begin to make their way back east on Tempe Town Lake along the north shore. Grab some hot chocolate and head down to central Phoenix to watch as dozens of lighted floats make their way down Central Avenue for the 30th edition of the APS Electric Light Parade! Parade begins at 7 p.m. The beautiful white Ahwatukee lights can be seen on Chandler Boulevard from 24th Street to Desert Foothills Parkway every. They are worth going the long way home to see.